Tags: Mt. Baker, North Cascades, Skyline Divide, Why? I’m back after a tumultuous week. We went on a road trip to Bellingham, Wash., and hiked in perfect weather on Mt. Baker (with a view of the North Cascades that extended deep into Canada). 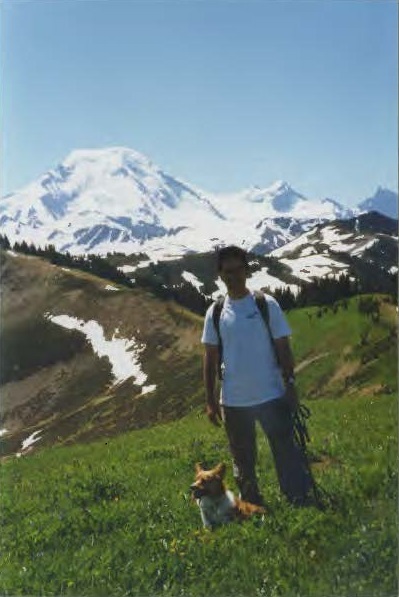 We last hiked Skyline Divide in 1995 and it was good to know that we could still do the steep ascent. Emma conquers the wilderness, spring 1995. I returned to a paying job, hallelujah, but a cold was raging through the office and by Wednesday afternoon it was mine, all mine. I somehow made it home and dived into bed, where I spent most of Thursday hallucinating that I was in Depeche Mode. I’m only starting to feel some synapses firing today. This is particularly frustrating because I’m dying to get back to my book. But first, what did I learn from the Write-a-thon, aside from the fact that my goal of writing 25,000 words in six weeks was somewhere north of insane? Many writers have said that while working on a novel they often flirt with other, smaller projects. (Special D is not of this school.) They give many reasons: It keeps them fresh, it’s a reward, it helps them get through those parts of the book where you feel as if you’re slogging through an ocean of mud. If I were to take a break from my book to work on a short story, I’d get so wrapped up in this new fictional world it that it would be hard to find my way back. Fiction is too involving for me, and anyway I write slowly. What the Write-a-thon taught me is that I could take breaks from my book by blogging. I’m listening to all this music anyway. Why not jot down a few insults and type them up later? Besides, blogging is done with a different part of the brain. I believe it’s the part of the brain we chew gum with. This explains why any idiot can be a blogger. Writing a novel every day and blogging every day were fine for six weeks but exhausting beyond that. So I’m returning to my original Sunday blogging schedule while I return to my book and while I figure out what “blogging” means for the future. Thanks, as always, for reading along. Your support means the world to me. When next we meet: All the bands I’m disqualifying from the “Let Me Count the Ways” band project! Why? takes hip-hop, stirs it up with a hefty scoop of indie rock, then tops it off with a sprinkling of psychedelic electro-pop. These Jewish art-school dropouts know how to emcee and throw down the beats – you’ll see some mad strumming, plucking, and schvitzing all night, too. Intuitive and intimate insight into a blogged mind. Thanks for sharing. Good call on giving the novel the priority time line.